Kelsey Wells started working out and eating well to get in shape after the birth of her son. She is now a personal trainer and has quite a following on Instagram. Here's how she starts off her mornings. (NEW YORK) — Kelsey Wells started working out and eating well to get in shape after the birth of her son. A few years later, she is a certified personal trainer with her own PWR workout programs and more than a million Instagram followers who watch her every workout move. Meditation, motivation and her workout clothes are just some of the things Wells relies on every day for her success. First, before I even get out of bed, I do a little bit of mindful meditation and kind of get myself centered for the day. I’ll grab my headphones and I love to play either a motivational song or I’ll watch a motivational speech or just listen to something uplifting. While I’m sitting there taking my breaths, I like to really envision the things that I have to do that day going well to kind of get myself in a positive mindset and ready to take on the day. Next, what I love to do every morning is wash and moisturize my face and my body. I have a facial cleanser, rinse it off, pat dry and then I moisturize. Living in Utah, it’s a desert climate so it’s very dry there. So I moisturize morning and night, face, body, everything. Every single morning I head downstairs and before I even make my breakfast I make myself a green, superfood drink and drink that with my breakfast. It’s simply just a superfood powder, so it’s loaded with micronutrients, antioxidants, things like that. Mixed with the apple cider vinegar that I put in it, it’s a great anti-inflammatory and it helps keep my digestion regular. It doesn’t taste the best. It’s not the easiest to drink, so it also helps wake me up. Then I like to get dressed and ready for the gym. Even if I’m not going to the gym right away, I still like to put my gym clothes on so that I’m productive and ready to go. 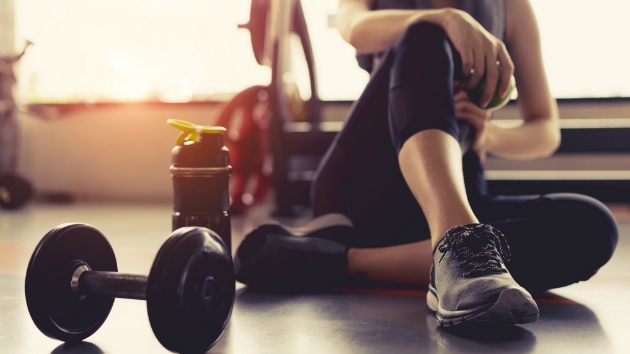 If you get up and get your gym clothes and you’re ready to work out, you’re a lot more likely to actually go and do it or just be productive while you’re at home than if you’re lazing around in your sweats and your pajamas. The last thing I do every single morning is the gym. Barbell squats are my favorite exercise. Barbell squats I feel like are super empowering and they are an excellent compound movement, so it’s seriously like a full-body workout in one move. When I began exercising regularly, in the beginning, it was to help my anxiety and it really did … I’m so happy to be able to holistically deal with my anxiety now through exercise and eating well.